Welcome to the Growth Formula Pond Fish Food superstore! Raising and keeping koi is a large investment, so naturally, you want to show off the biggest koi around! Our selection of growth formula koi foods features specially formulated pellet foods designed to stimulate the metabolism of your koi and enhance growth naturally. These fresh, wholesome pellets are sure to create the biggest koi feeding frenzy yet! 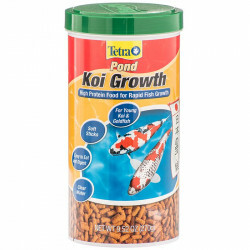 Pet Mountain's Growth Formula Pond Fish Food store features top quality products from the most trusted names in specialized koi fish food and pond care, including Tetra Pond and Hikari. Tetra Pond Koi Growth Koi Food is a high protein food for rapid fish growth containing essential amino acids that help younger fish grow. High protein levels promote rapid growth and vitality and are ideal for late spring, early summer feeding. Soft sticks are easy to eat and digest and keep your water clear. Tetra Koi Growth is a completely balanced diet that provides the extra protein and perfect blend of vitamins and minerals needed by young Koi to attain maximum size, health, coloration and disease resistance. 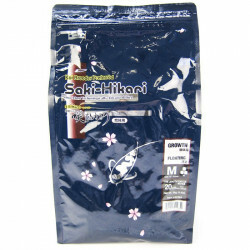 Hikari Saki-Hikari Growth Diet Floating Pellet Koi Food features a a formula that offers considerably improved growth with nutritional components that promote fat deposit free development. In addition to the improved growth of your Koi, this revolutionary formula contains a probiotic called the Hikari Germ. This unique, beneficial bacteria overpowers bad bacteria within your fish and nullifies the ability of bacteria to lethally infect your fish. Hikari Germ also accelerates the digestive process and reduces waste output, which helps keep your water clean and clear. 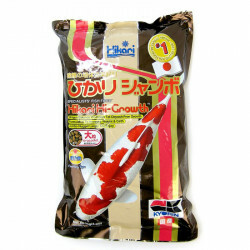 Hikari Hi-Growth Large Pellet Koi Food is a powerful, supplemental diet specially developed to promote championship form in Koi. This advanced diet, full of proteins, vitamins and minerals in perfect balance, increases your Koi's gloss and luster, as well as their overall size and weight. These floating pellets allow for easy monitoring of amount eaten, helping to eliminate dangerous over-feeding. The high digestibility of this product also creates less waste, which leads to cleaner and clearer water.